Laser Specialists Inc, a long-time, valued dealer of Satel USA, has been using the SATEL Compact-Proof together with SenseFly’s eBee mapping drone for added RTK accuracy and flexibility on-site. This easy set up has been ideal for Laser Specialists’ mining and construction clients, finding use in quarries, stock piles, excavation and highway construction, where accurate maps and 3D models are needed to calculate volumes and perform site surveys. The added flexibility the SATEL Compact-Proof provides is an operational advantage. Versus being physically tied to the RTK base at a specific location, the SATEL radio link allows the drone operator to place the base anywhere onsite and move around as needed throughout operation. With the Compact-Proof’s built-in battery and IP67 housing, the radio is conveniently mobile and can easily operate for a full day on-site, holding up to the dust and rugged elements of a construction site. The improved accuracy is also significant. In standalone operation, the drone flies within 10-15 ft accuracy. With the RTK base and SATEL Compact-Proof in place, that accuracy ranges from .9 to 1.5 cm, a drastic improvement that is especially valuable across construction and earthwork movement applications. As Eric Wischropp of Laser Specialists explains, this accuracy is appreciated even in the operational task of landing the drone. With RTK accuracy, the drone can easily be brought down in most locations on the job site. Without this accuracy, the operator has a more difficult and tedious task, needing to strategically identify a larger area for safe landing. The Compact-Proof connects via USB data cable to the drone operator’s laptop, which runs the eMotion software that routes the UAV through its predetermined route. 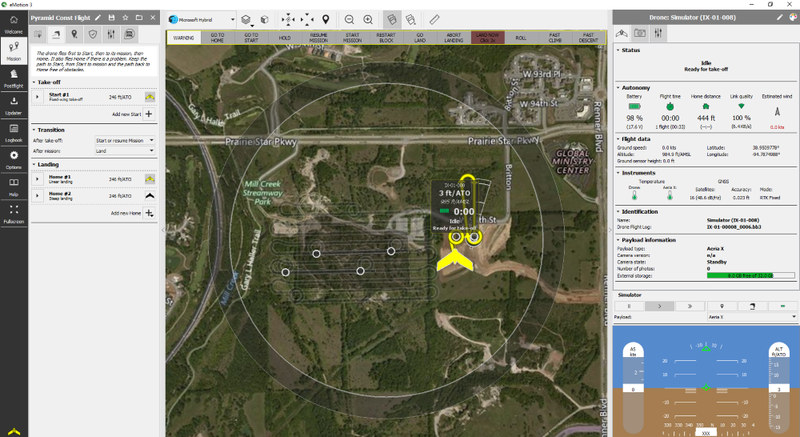 The Compact-Proof provides a real time data link to the base, which sends position corrections to the GPS receiver on the eBee every second, with an audible indication as images are captured. The built-in battery on the Compact-Proof makes for an easy, mobile solution, allowing the operator to move across the job-site as needed. The SATEL Compact-Proof can also be used as an external radio at the base, if the GPS unit is without a built-in radio. At 1W output power, the Compact-Proof can easily cover the range needed for most drone flights. The UHF signal also outperforms 900 MHz ISM and makes for much more reliable connectivity. In other cases, such as a long-range roadway project, Laser Specialists has integrated the SATELLINE-EASy Pro 35W, either at the base or as a repeater, to allow for a larger working range. This solution provides the possibility of integrated machine positioning and robust onsite capabilities. Satel USA provides a complete Compact-Proof kit for easy set up. For more information and pricing, please contact Laser Specialists Inc. (Ph. 913-780-9990, eric@lasergps.com), or your local Satel USA dealer.